The panoramic view of Clonmines medieval borough, pictured above, is quite surreal. This Norman settlement may have been established by William Marshall in the 13th century as an alternative port to New Ross. 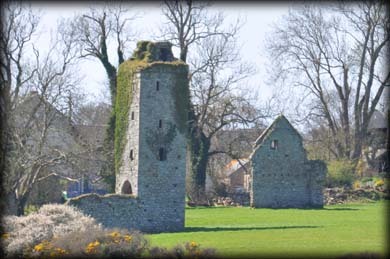 The remains of the town, which was abandoned by the 17th century, include two tower houses, two fortified churches and an Augustinian Friary. The tower house, pictured right is known as the Black Castle is attributed to the Fitzhenrys, although there is no documentation to support this. 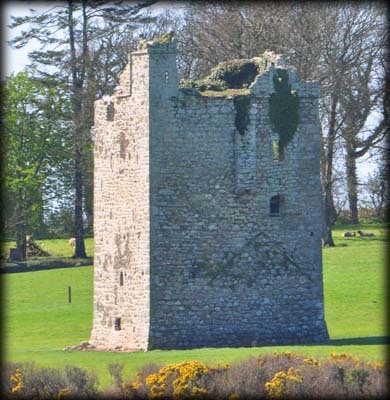 The Fitzhenrys had another castle at nearby Kilcavan. The entrance to the five storey tower house is on the west side and is protected by a machicolation and a murder-hole. The wall walk and crenellations have not survived. A garderobe chute can be seen protruding from the east wall. To the right of the tower house the two fortified churches, out of picture, can be seen in the distance. I do hope I can get permission to view these monuments closer in the future. It is believed the Abbey, pictured above, was founded by the Kavanaghs for the Augustinian Friars in about 1317. The Structure was extended and fortified by Nicholas Fitzhenry in c.1385. The original church is almost complete. The cloister and domestic buildings were on the northside of the church. A tower was added to the east end of the nave. The Abbey is situated at the southern end of a large bawn/enclosure. At the northwest corner of the bawn a corner tower, pictured below left, survives. The main entrance to the bawn was through a gatehouse that was added to the west end of the nave when the abbey was fortified. A postern gate is located in the west wall of the bawn just south of the existing corner tower. The Friars were expelled in 1544 but continued to serve in the locality up until the 18th century. Situated: The medieval town is best viewed from Ballyannan Graveyard on the R 733, just west of Wellingtonbridge. Discovery Map 76: S 8440 1288. Last visit April 2015.